Claire always loved spending summers at her family's lake house. She felt close to her late mother there, but this year is different. Her father and new stepmother Pam have cleared out all of her mother's belongings. They are expecting a baby and for them a new and exciting period has started. Claire hopes to find support with her sister Abi, but Abi has other things on her mind. She has just discovered that boys are liking her back and she regularly sneaks out to be with someone she finds more interesting than her sister. Claire spends a lot of time on her own and keeps having to cover up for Abi. Claire is feeling lonely and left out, but is this really justified or are her own actions also part of the problem? Will her summer be a disaster or will she be able to have fun in a different way by giving new experiences a chance? 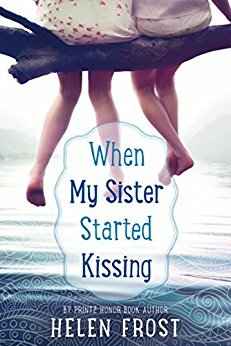 When My Sister Started Kissing is an impressive story about growing up. I was immediately mesmerized by Helen Frost's beautiful words. Her writing is absolutely stunning. I love stories in verse and I liked that she's given each character she writes about their own form. It brings variety and the structure is clear and interesting. Because of the way she writes her story is deep and meaningful, which is something I loved about it. When My Sister Started Kissing is a gorgeous story about change, grief, hope and happiness. I really enjoyed reading this fantastic book. If you love stories in verse you should definitely read When My Sister Started Kissing. It's a story meant for the 10-12 age range, but because of the beautiful writing I'd recommend it to adults as well. OMG! Where do you find all these books?! Sounds wonderful. That's why I love this blog. Thanks for the compliment, a lot of time goes into finding the books we want to feature, so I'm glad it helps :). I absolutely love stories in verse--it is hands down one of my faves--so thanks so so much for sharing this. I am going to run and add this to my TBR. The sister dynamic always intrigues me! A story in verse? Now that is an accomplishment. It sounds like a really good read .I love how the sisters go through the experience in a different way. Verse is an interesting way to tell this story. Sounds good. I love coming of age books like these. Great review! And another amazing review from one of the best blogs! Middle grade lit has a lot of treasures, this definitely seems to be one of them! It's in verse? Gosh, how long did that take Helen, I wonder? BTW, Helen is my sister's name!